Fetchapet move pets by road within the UK and offer safe and secure transport in DEFRA Type 2 Approved vehicles with experienced drivers. Moving home can be a very stressful experience for both humans and animals alike. 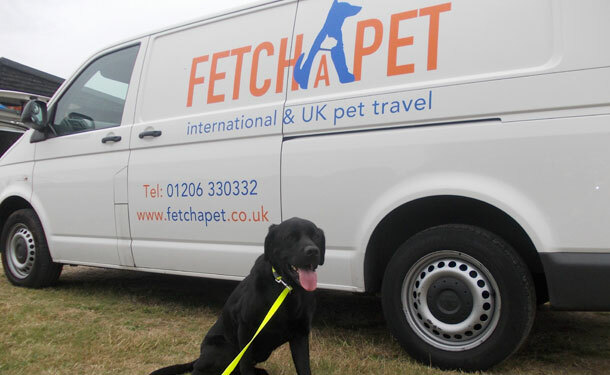 Fetchapet are happy to be able to offer a road transport solution for domestic pet animals of all types, shapes, sizes and breeds. Our own air conditioned and fully fitted vehicles offer discerning pet owners the opportunity to have their animals relocated in a trouble free and professional manner while they attend to the moving of their household and the rest of the family. We will collect your animal family from your current address, house them in one of our partner boarding establishments for as long or short a period as necessary, and then once you are ready for your pets to join you in your new home we can deliver them directly to your premises in our fully equipped and air conditioned DEFRA Type 2 Transporter approved vehicles. Of course, if you just need collection from one address in the morning and delivery to another in the afternoon, we are happy to offer this service from and to any UK location. We can also collect pets on your behalf from breeders, previous owners, kennels and catteries, veterinary clinics and hospitals, and when arriving in the UK at any of the major ports or airports. Our animal handlers and drivers have decades of experience in transporting and looking after client’s pets, so you can just attend to the human side of the move knowing for sure that the animal side is being professionally taken care of by Fetchapet.